The Season for #ag & #horticulture Questions! This past week was a blur of calls, questions, and visits to homes and fields but it was a great week and flew by staying very busy! I’ll touch on a few of the common questions I’ve received this week. 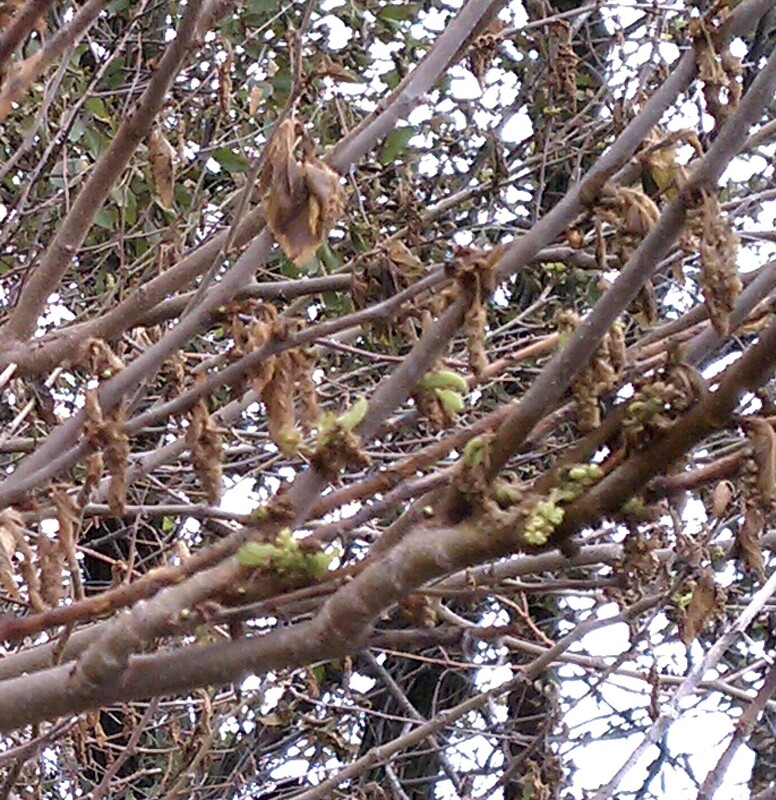 Trees: Some trees such as willows, hackberries, tops of maple trees, ash, and black walnut are just taking time leafing out. Some trees leafed out once already and dropped leaves. Things that may have caused this were the sudden flux of temperatures from very warm to cool and the strong winds we received. Some trees have also unfortunately had herbicide drift damage that caused leaves to drop. On those trees, watch for new buds as nearly every situation I’ve looked at thus far have new buds forming after about a week-10 days. With all these situations, give the trees a few weeks to leaf out again and if they’re still not doing it, feel free to give me a call. Trees are interesting plants as sometimes environmental impacts that happened 3-5 years ago will show up that much later-and sometimes environmental impacts show up right away! Disease/Insect issues: This year has been a strange year all around but with our warm winter, I was concerned about an increase in diseases and insects. Thus far, we’re experiencing increases in both-so hang on-it may be a long growing season! Our high humidity, warm temps, and heavy dews have created perfect conditions for fungal diseases on our trees, ornamental plants, lawns (I’m currently fighting a bad case of powdery mildew-as a plant pathologist it is kind of pretty but I don’t like what it’s doing to my lawn! ), and in our wheat and alfalfa crops and some pasture grasses. Fungicides may help in some of these situations, increasing airflow can also help as can more resistant varieties or hoping the weather will change. In the case of most ornamentals, we don’t usually recommend doing anything. The same goes for insects as insecticides can help in some situations. I’ve received several calls this past week of people afraid they had herbicide drift damage. While there were a few cases of that, many of the cases were actually fungal leaf spots on leaves. There are various fungicides and insecticide products available from home/garden centers, etc. Be sure to read and follow all label directions and only apply the product on places the label specifies it can be applied. Crops Update: Later this week we may have a better idea on the extent of storm damage and if some fields will need to be replanted after the storms from last week. Dr. Bob Nielsen from Purdue University reported that most agronomists believe young corn can survive up to about four days of ponding if temperatures are relatively cool (mid-60’s F or cooler); fewer days if temperatures are warm (mid-70’s F or warmer). Soil oxygen is depleted within about 48 hours of saturation and we know soil oxygen is important for the root system and all the plant’s life functions. So we’ll have to wait and see what happens. Have also had a few calls regarding rye cover crops. When rye is killed out and decomposing, it releases toxins that can affect the germination of other cereal crops such as corn if it’s going to be planted into that rye cover crop. Thus we recommend at UNL that the producer kill the rye and then wait at least two weeks to prevent any major damage to the crop. I realize at this point with the rains to get in and kill that crop on top of waiting an additional two weeks, we’re getting close to the end of the month and will most likely be looking at reduced yields…and depending on maturity, you may need to consider different seed if you end up having to plant in June. If you have specific questions about this, please let me know and we can talk through some situations. Stripe rust and powdery mildew have been obliterating mid-lower canopies of many wheat fields. I’ve received several calls on why wheat canopies are yellow-that’s the main reason but other factors such as the dry spell prior to these rains and/or deficiencies in nitrogen/sulfur or some viruses may also have been factors. Wheat in Nuckolls County last week was beginning to flower. Fungicides such as Prosaro, Folicur, or Proline are labeled for up to 50% flowering and cannot be applied after that. Remember the wheat head begins pollination in the middle-so if you’re seeing little yellow anthers at the top or bottom of that head, you’re towards the end of flowering. All those products have a 30 day pre-harvest interval-which has been the other main question-are we going to be harvesting in a month? I do believe we’ll be harvesting a month earlier than normal just because pretty much everything in wheat development is about a month ahead of schedule. I still feel the 30 day window for the fungicide application is worth it with the large amount of disease pressure we’ve seen. 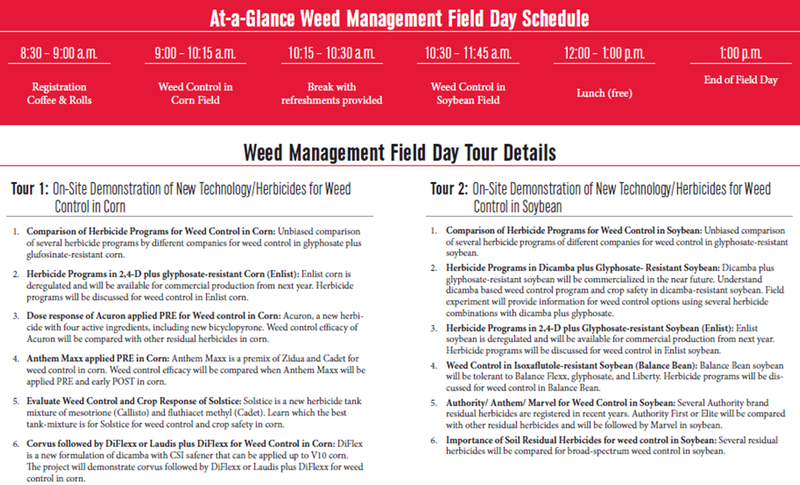 Wheat in Clay Co. and north still may have time for a fungicide application; those products mentioned above will help prevent Fusarium Head Blight (scab) as well as kill the fungi causing disease already present on your leaves. A list of all fungicide products, pre-harvest restrictions, and rates can be found here. Also check out my previous blog post with video on scouting for wheat diseases. The other major disease appearing in wheat is barley yellow dwarf virus. This is a virus vectored by bird cherry oat aphids which we were seeing earlier this year. Unfortunately, this disease causes the flag leaves to turn bright yellow-purple causing yield loss (at least 80% of the yield comes from the flag leaf) as there’s nothing you can do once the virus manifests itself in those leaves. If you have a large incidence of barley yellow dwarf in your fields, you may wish to reconsider spraying a fungicide as the fungicide won’t kill the virus; however, it will help kill the fungi on the remainder of your leaves and potentially help protect some yield from the two leaves below the flag leaf. 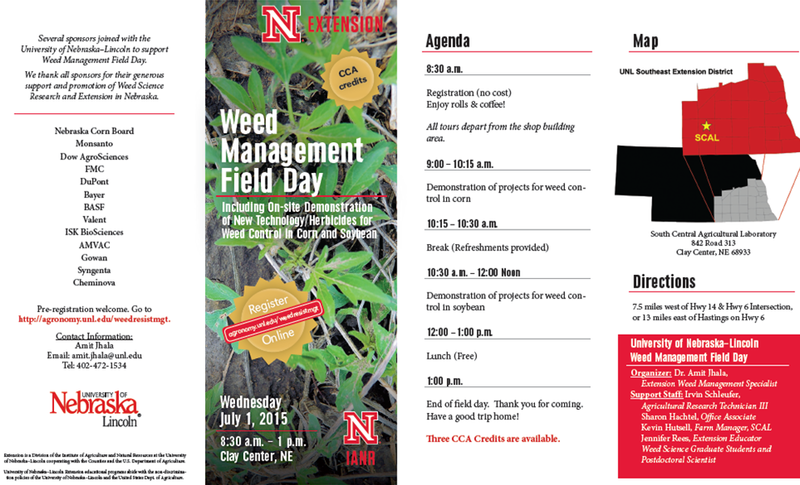 With the increasing problem of controlling weeds such as marestail (horseweed), UNL has recommended using fall applied herbicides to help control this in addition to winter annual weeds. This practice usually does help with weed control, but I hadn’t thought about the considerations when grazing corn stalks until I received a recent question on it. 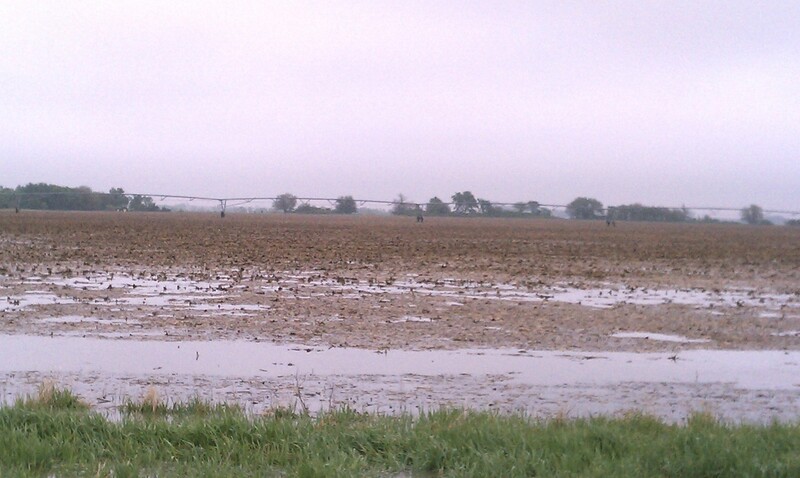 The farmer wanted to see if it was safe for his cattle to graze corn stalks after a fall herbicide had been applied. The label wasn’t clear so he gave me a call. I won’t provide information for the various herbicides that can be applied in the fall, but I will recommend that if you are planning on having your cattle graze stalks, that you check to see if a fall herbicide was applied and check the pesticide label to determine if there are any grazing restrictions with that pesticide. If the label doesn’t specify any restrictions, then it should be ok. If you want to be on the safe side, a rule of thumb many chemical reps use is to use the pre-harvest interval for the amount of time to wait before grazing stalks. Some labels will say that residue should not be grazed or baled and fed to livestock. Sometimes studies were actually conducted to know there is a safety concern. In other cases, the chemical company may not choose to conduct all the studies the EPA required for labeling due to high costs. If that’s the case, the EPA requires the strongest restrictive language be placed on the label. Regardless, if it says there’s a grazing restriction on the label, the label needs to be followed. Your cattle may not be affected by grazing stalks where a chemical with a grazing restriction is on the label, but there may be other concerns such as problems with the chemical affecting the calf or being retained in the cow’s milk. 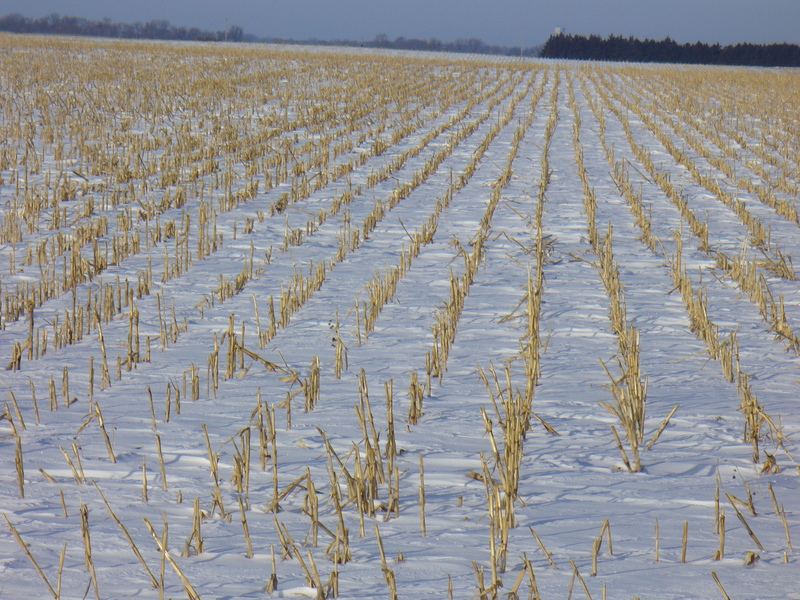 I’m still recommending utilizing our corn stalks by grazing and utilizing fall-applied herbicides for weed control. I just also recommend you check the pesticide labels on fields where a fall herbicide has been applied to determine any grazing restrictions or safety concerns.